← Tomato Plants: Determinate, Indeterminate, Semi-Determinate – what do they mean? How do I stop green stains on towels when handling tomatoes? 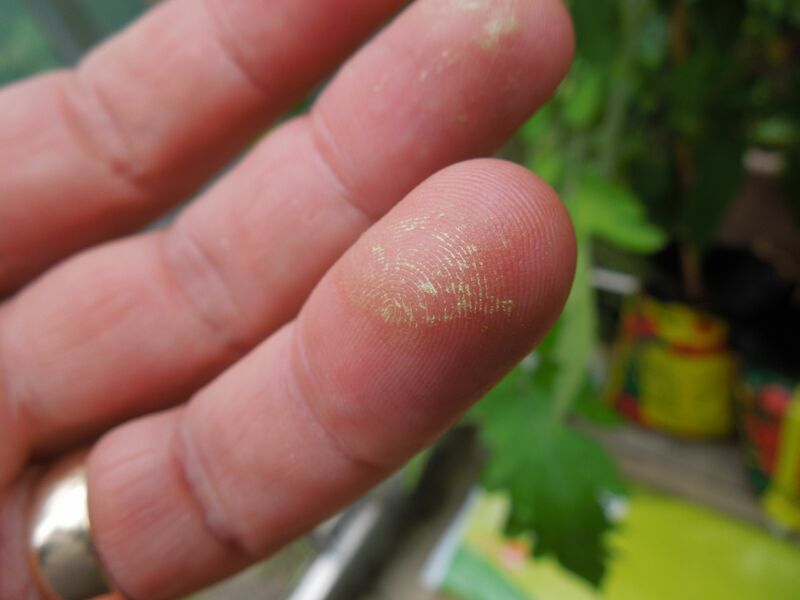 When you handle tomato plants, you’re bound to get your hands coated with a yellow powder that causes stains on the towel even when you’ve washed your hands carefully with soap and water. The yellow powder is known as “Tomato Tar”. On your skin it is faintly yellow but it reacts with alkaline things like soap and detergent residue to turn green. So, regardless of how much you scrub at your hands, if there is any left when you dry your hands on that nice white towel, the detergent residue in the towel slowly reacts with the tomato tar to leave the telltale green stains and cries of hatred from your other half. Tomato Tar comes from the trichomes on the surface of the plant. These contain chemicals that include all the essential oils to give that lovely tomato smell, but also acylsugars. Alcylsugars are part of the defensive system of the tomato as they are the basis of a fast drying glue which stops insects walking too far. (It behaves like “concrete boots” as the insects walk about). However, acylsugars aren’t soluble in water so rinsing your hands under the tap doesn’t do any good. However, there is a solution. Acylsugars dissolve in acid. So washing your hands in a dilute acid solution (a couple of tablespoons of vinegar is perfect) and then rinsing it off with soap and water will remove the tomato tar and leave you innocent of any green stains … until you forget. So no matter how good you are, the best thing is to wash with a small quantity of vinegar, soap and water and then use the special towel that is only for people coming in from the garden. So there you go. The stains on the towels were not your fault, but that of the tomato plant in trying to defend itself from insects. This entry was posted in Questions & Answers and tagged Stains, Tar, Tomato. Bookmark the permalink.